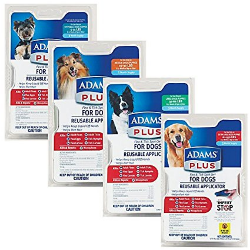 Provides flea and tick protection for dogs for up to 30 days and protection from flea and tick infestation beyond. That's because it doesn't just kill adult fleas and ticks, it also prevents infestation by knocking out flea eggs, flea larvae, tick nymphs and tick larvae that could cause a problem later on. Plus, it kills and repels mosquitoes. Comes with the award-winning Smart Shield® Applicator that helps get the treatment down to the skin, where the bugs live, and helps keep the treatment off you. Puts the liquid on your dog - not your hands.Contains the Infest Stop™* ingredient that kills flea eggs and larvae. Kills tick nymphs and larvae. Breaks the flea & tick life cycles. Kills and repels mosquitoes. Helps prevent reinfestation.